The course is laid out within the confines of a test track. We have nine greens with 18 tee blocks. The front 9 tee blocks are all on the inside of the track whereas the back nine tee blocks tend to be set further back with the 12th, 13th and 16th tee blocks being set on the outside of the track. Hence a front 9 total distance of 1,334 yards and back 9 of 1,756 yards. When the track is open it is a strict rule (Health & Safety) that no one is allowed to cross or go onto the track and instead of using the 12th, 13th and 16th tee blocks the 3rd 4th and 7th tee blocks are used. Barrow Hills is a par 56 course (front 27, back 29), but don't be fooled, this is not just any ordinary 'par 3' course. Many of the holes are extremely challenging with narrow fairways, tall trees and strategically placed bunkers! 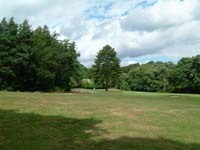 For example the 9th green set slightly above the 9th tee block is protected by an old and very tall fir tree. If you want to approach directly over the tree it will take a very big 8 iron in good conditions! Alternatively, a well judged fade for a right hander which if it doesn't work will end you up out of bounds! For the faint hearted, a short shot to the right of the tree with a chip in is the safe bet. It's a thinking man's course which will certainly help to develop your short game. Make sure you bring along extra balls, if you go out of bounds and the track is open you're not allowed to retrieve your ball!! It ensures a steady stream of second hand balls are available in the clubhouse the proceeds from which go into the captain's charity. Enjoy.